i have some problems to make a good looking material like the yellow "plastic foam"
If you need a closeup shot, then I'm afraid this can't be achieved by just material. You will need a very complex mesh or at least some details scattered over a base mesh. You could make an approximation, then use Corona Scatter to add fibers to the mesh. Unless it's a close-up, I wouldn't bother though. im the one who already tried doing a foam material. For me there was only one way to do it because i needed a close up. So my final foam was geometry. If you are far enough away you could try da displacement map. A cellular or Noise/turbulance could work. Interesting question. I made a test. I'm not really satisfied but with some tweaking and using SSS (used translucency and refraction because I haven't got the latest build with SSS yet) I think it could be better. I have to look for a better noise map. This one is the 3ds max own cellular map. The best result was with chips but it needs bubbles instead of chips. i added a detail of the "foam". I have little experience in noise maps so this could improve a lot. the model uses an opacity map and I scaled 3 blocks bit smaller than the original one to give it depth. The different blocks have slightly altered noisemaps. it is possible to have a look in your mat,or can u please upload it? Can you try it with a torus form? Good to hear you liked it. I added a wire frame image to explain how I did it. I used 3 layers slightly differing in size. The rest of the images are tests. Some of them only rendered a few passes. Sorry I didn't have more time (and patience). Yes I added a few. And some twisted ones. Also testing different colors. Every color works differently I noticed. The contrast of the bubbles and the foam is very tricky. The image of the yellow headphones shows the same. In the center of the bright yellow foam you can't see the bubbles. On the edges you see it is foam. That's why I also added a twisted torus. It look more plausible as the normal torus, even if the normal one has noise added to it. Except from the strange white haze on the inside of the torus. Must be a wrong reflection/ior/glossiness thing. The torus twisted with noise has nice edges but I added too little segments so you can see the polys. 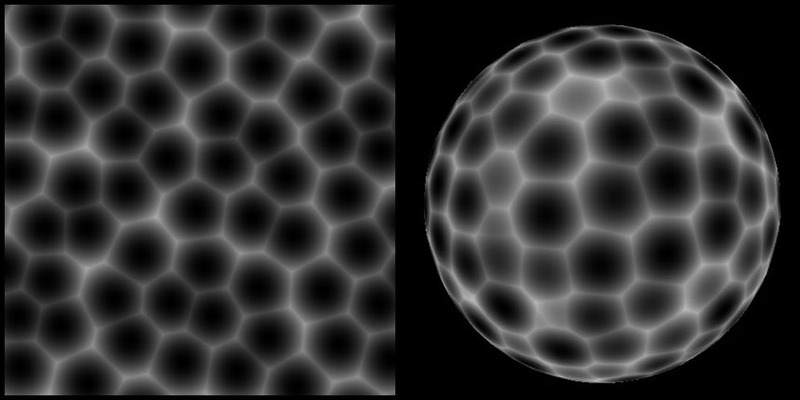 I also tested with some noise modifier on the outer layer and with the scale and density of the noise maps. Again I think this material could get better with SSS and with better a noise maps. (and a lot of tweaking :)). I'll post/share my max file. I warn you it is a big mess. It sufferd from the tests. Especially the materials. Looks really nice! As for noise, you can try Bercon noise map, i think it would fit there. Tha bad part is that it seems that it's a game with transparency, and this makes teh render pretty slow I'm afraid, I'll try your max when I have som time, probably a great solution for static pictures, but probably a slow solution for animation, anyways I can't think in anything better than this apart from pure modelling. Congrats on this and cheers! The material setup is result of a lot of trial&error. There are definitely some items in the setup that can be discarded. I can try to build up the material from scratch. This setup is very slow. I don't know if SSS is faster. I tried berconmaps. but I can't find the right setup for a rounded, hexagon structure. here i copied rambambulli´s Setup and also used the bump and Displacement shader. For cutout, bump and displacement i used a standart noise map with a edited output curve. Great!! This is a big improvement!